The preeminent physicist and Nobel Laureate, Niels Bohr, once said that there are "Two sorts of truth: trivialities, where opposites are obviously absurd, and profound truths, recognized by the fact that the opposite is also a profound truth." Physics is replete with examples of this, the most important of which is the wave-particle duality of matter. This duality of concepts was the topic of a book by Gerald Holton, who called these thema/antithema pairs. Likewise, pursuing the opposite has been fruitful in many other studies. There's the positron, paired with the electron; and the semiconductor hole, paired with electrons in solids. In cosmology, there's dark energy. It seems that if you want to discover something new, just turn a physical principle on its head and check to see which way the blood flows. Capacitance is a well known concept in electostatics. The capacitor was invented by the German cleric, Ewald Georg von Kleist, in 1745, and independently by the Dutch scientist, Pieter van Musschenbroek, sometime between 1745 and 1746. Van Musschenbroekof resided in Leiden (Leyden), so the capacitor was known as a Leyden jar. A Leyden jar in cross-section. The glass jar (C) is coated on the inside (B) and outside (A) with metal foil. The region near the mouth of the jar is uncoated to prevent discharge along that path. Electrodes connect to the inner and outer foils. The most memorable Leyden jar experiment was performed by Jean-Antoine Nollet, who is also credited with giving the device its name. In 1746, Nollet, who was an abbot, was easily able to persuade about two hundred monks to stand in a circle about a mile in circumference, connected to each other by iron wire. Nollet then discharged a series connection of several Leyden jars through them and watched them jump. Since the monks jumped at essentially the same time, Nollet reasoned that the speed of transmission of electricity was very high. This formula is true for common capacitors, but what if it were possible to make a device that has negative capacitance? If a negative capacitance were placed in series with a normal ("positive") capacitor, the absolute values of capacitance would add up. That's a nice trick, but how do you make a negative capacitor? 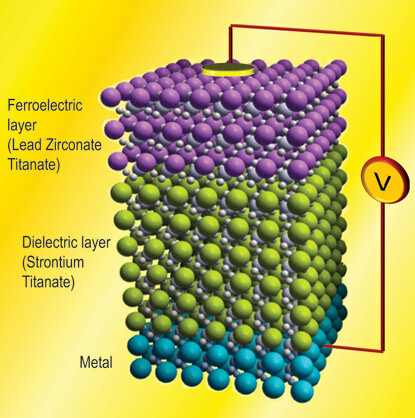 Artist's rendition of a lead zirconate titanate/strontium titanate negative capacitance stack. The technological significance of negative capacitance is that the accumulated charge is amplified for a given voltage. The research team showed a two-fold enhancement in charge for the same applied voltage with a possibility that the effect can be greater still. When applied to integrated electronics, this discovery translates to a smaller required voltage to produce a charge at the gate of a memory cell transistor. Smaller voltages mean less power is required to operate computer chips. One constant in the operation of memory cells is that each ten-fold increase in drain-source current requires application of an additional 60 millivolts on the FET gate. An adequate on-off margin has required a minimum of one volt. This voltage requirement, however, is just a reflection of a charge requirement, and the negative capacitance will give the same gate charge at lower voltage. As could be expected, the research team is investigating other ferroelectric materials, as well as ways of incorporating such materials into transistor architectures. One interesting finding is that the negative capacitance effect persists above 200 °C. Standard chip operating temperatures are about 85 °C. This research, which has been ongoing since 2008, is supported by the Semiconductor Research Corporation and the Office of Naval Research. As quoted by his son, Hans Bohr, in "My Father", published in Neils Bohr : His Life and Work (1967), p. 328, via Wikiquote. Gerald Holton, "Thematic Origins of Scientific Thought: Kepler to Einstein," (Harvard University Press, 1988), 510 pages (via Amazon). Leyden Jar page on Wikipedia. Sarah Yang, "Ferroelectrics could pave way for ultra-low power computing," University of California - Berkeley Press Release, September 12, 2011. Asif Islam Khan, Debanjan Bhowmik, Pu Yu, Sung Joo Kim, Xiaoqing Pan, Ramamoorthy Ramesh and Sayeef Salahuddin, "Experimental evidence of ferroelectric negative capacitance in nanoscale heterostructures," Applied Physics Letters, vol. 99, no. 11 (12 September 12, 2011), Document No. 113501. Linked Keywords: Physicist; Nobel Laureate; Niels Bohr; wave-particle duality; matter; Gerald Holton; positron; electron; semiconductor; hole; cosmology; dark energy; capacitance; electostatics; German; cleric; Ewald Georg von Kleist; Dutch; scientist; Pieter van Musschenbroek; Leiden; Leyden jar; Wikimedia Commons; Jean-Antoine Nollet; abbot; monk; mile; iron; discharge; electricity; series; parallel; capacitor; reciprocal; absolute value; dielectric; Applied Physics Letters; University of California, Berkeley; University of Michigan (Ann Arbor, Michigan); ferroelectric; lead-zirconate titanate; lead; Pb; zirconium; Zr; titanium; Ti; oxygen; O; strontium titanate; strontium; Sr; Asif Khan; charge; voltage; integrated electronics; gate; memory cell; MOSFET; transistor; power; drain-source; current; Semiconductor Research Corporation; Office of Naval Research.